Bringing the world of business into the classroom, this Cambridge Elevate edition helps students identify, plan, implement and evaluate their enterprise projects. The digital resource has four sections based around the stages of the project with theory integrated throughout. This helps students relate their practical enterprise project with the academic principles of business. 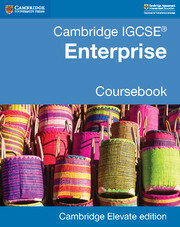 With a foreword from the specialists at Cambridge Judge Business School, this coursebook helps students appreciate Enterprise skills in the world around them and talk to business people in their communities. Suggested answers to the exam-style questions are in the teacher’s resource. The free online teacher support helps to reassure teachers when implementing the course.